Now that the shutdown is over and the debt ceiling is up, it’s time to do some Monday morning quarterbacking. 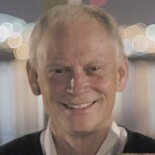 I am reminded a story I read recently in Joseph J. Ellis’s book, Founding Brothers. If I were the true academic, I would reread, fact check, and footnote. But sometimes I just tell ‘em as I like to remember ‘em, not letting the facts get in the way of a good a good story. The story is, nonetheless, pretty much the way it happened (or happens). 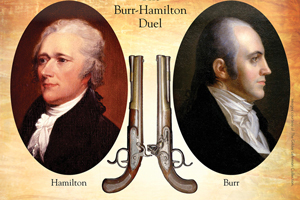 On July 11, 1804 at Weehawken, New Jersey Aaron Burr, Vice President of the United States, mortally wounded Alexander Hamilton, former Secretary of Treasury, in a duel with .55 caliber ball fired from a smooth-bore pistol at twenty paces. That size projectile would have the devastating effect of a small cannon ball if it hit a person. At the same time, a smooth-bore dueling pistol was so inaccurate that rarely was anyone ever wounded or killed—even at just twenty paces. Those are the facts, but the analogy is in the backstory. 1. The American Revolution was unique in many ways, including the fact that (with this one exception) the Founders Fathers never declared all-out war on each other. Throughout the following two or three decades they debated, argued, compromise, and accommodated their vastly competing political perspectives. But they did not attempt to kill one another. 2. 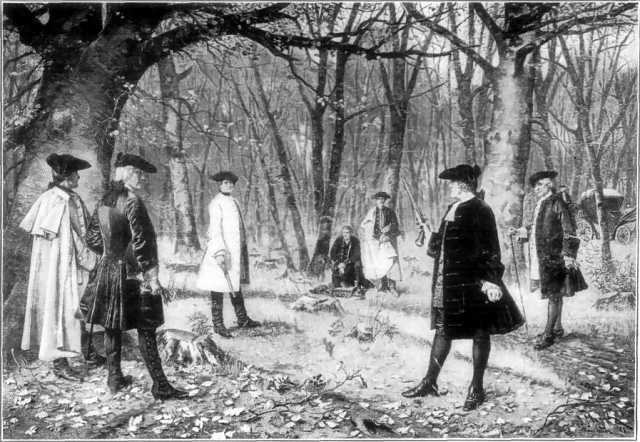 It was Burr, the Jeffersonian Republican, who challenged Hamilton the central-government Federalist, to the duel. At first Burr demanded a simple apology for a single comment. But as Hamilton refused to seriously address Burr’s grievance or negotiate a compromise, the animosity escalated as did Burr’s demands. Eventually, Burr’s demanded that Hamilton apologize and retreat from every position and statement with which Burr disagreed—even from sincere political differences. The general public was horrified at political leaders engaging in such dangerous confrontations. 3. Whenever nations, political factions, or individuals threaten each other, it is impossible to predict how it will escalate or how it will all end. Probably neither Hamilton nor Burr intended to pull the trigger, at least not while aiming to kill the other. Hamilton declared the evening before the duel that he intended to waste his shot. In many cases, one would challenge the other to a fight to the death, but waste their shots and negotiate a settlement that preserved the honor of both men. However, even though both parties planned to stop short doing something disastrous, the momentum of events took over. 4. There was a lot of controversy about who fired first, and the issue remains unclear. After more that 200 years it’s still hard to tell who was to blame. Both sides blamed the other. 5. Burr won the duel to save his honor but at the cost everything that was important to him. Burr became one of the most hated men in America. His personal brand and reputation suffered greatly, and thus his political career was over. He was even labeled as a traitor to the American Republic and likened to Benedict Arnold. 6. The general public was horrified at political leaders engaging in such dangerous confrontations. So there you go. In the recent shutdown and debt ceiling debate, neither of the dueling parties accomplished much. I’m not a Democrat and not a supporter of the President’s policies or of the Affordable Care Act. However, as military leaders from from the Revolutionary and Civil Wars used to say, “You have to pick good ground on which to fight. House Republicans’ in their attempt (some would say, “reckless attempt”) to kill off ObamaCare, may have done themselves and their brand the most damage. This entry was posted on October 24, 2013 by wlw747 in Uncategorized and tagged burr, debt ceiling, duel, hamilton, shut down.